Fries are an incredible food, even bad fries. They're up there with fire as one of the best things ever to happen to humanity, but they've always butted up against their fundamental limitation. They're fried potatoes, not fried dough. That time, however, is no more. We're happy to report that fries have reached their final form. 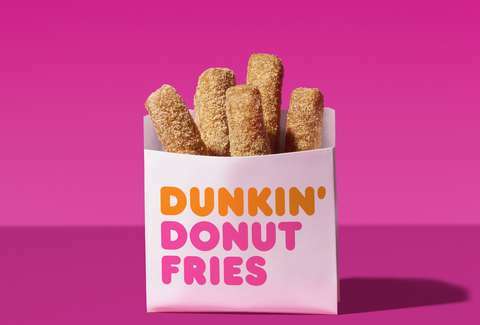 Dunkin' Donuts is finally rolling out its Donut Fries nationwide. As of July 2, you'll be able to enter any given Dunkin' Donuts and leave the proud owner of warm "buttery croissant style donut" that's been tossed in brown sugar. For $2, you'll get five of these dough sticks, which means that for a mere $4 you can pretend all your fingers are donut fries. Unfortunately, they'll only be available for a limited time, but it's better to have loved and lost than never to have loved at all. Previously they were only available at a few locations in Boston and Providence. It does seem a little insane that a test was needed to establish that Americans would want something called Donut Fries, but that's in the past now. Donut Fries are the future.